Jianmin Cui’s lab investigated mechanisms of the an important ion channel called the BK channel, which is associated with high blood pressure, autism and movement disorders. By changing one small portion of a stimulus that influences part of one molecule’s function, engineers and researchers at Washington University in St. Louis have opened the door for more insight into how the molecule is associated with high blood pressure, autism and movement disorders. The finding, published online Feb. 14 in the Journal of General Physiology, lays the foundation for further understanding into mechanisms behind the connection of the molecule with these and other diseases, such as epilepsy and circadian-rhythm disorders. Cells have ion channels, which are pathways that regulate current through the cell membrane and open in response to physical signals, such as voltage, or chemical signals, such as calcium, potassium or sodium. But these channels typically allow one type of ion to pass through; for example, the BK (big potassium) channel allows only potassium. Jianmin Cui, professor of biomedical engineering in the School of Engineering & Applied Science, and collaborators in three labs at WashU are studying the BK channel, which has been found to be important in regulating neuronal function and blood pressure. “This channel is interesting in two ways: one, because it is physiologically very important, and, two, because the mechanism that makes it work is very interesting and quite unique and provides a way to study how the physiological signal is used to open ion channels,” Cui said. Unlike most ion channels, the gate that opens and closes the BK channel is activated by a change in voltage and by calcium ions, but scientists do not understand how they work together to open the channel. To answer this question, Cui’s co-author and collaborator, Lawrence Salkoff, professor of neuroscience and of genetics at the School of Medicine, found that, when he removed a portion of the protein for calcium stimulus to open the channel, voltage still worked to open the pore. 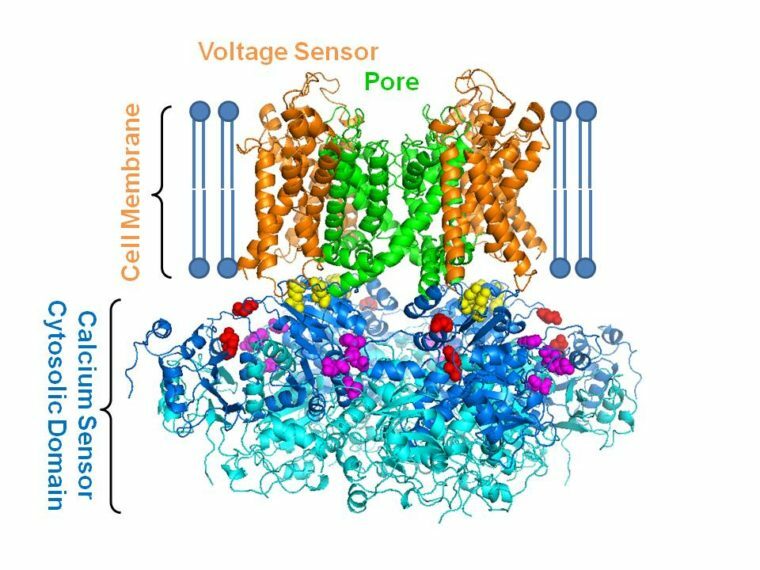 Salkoff’s truncated BK channel allows the investigators to examine how the intracellular domain, which serves as the calcium sensor, influences voltage stimulation of channel opening. Cut said the finding creates even more questions about this function in this important ion channel, the activity of which also has implications in smooth muscles including the lungs and uterus.